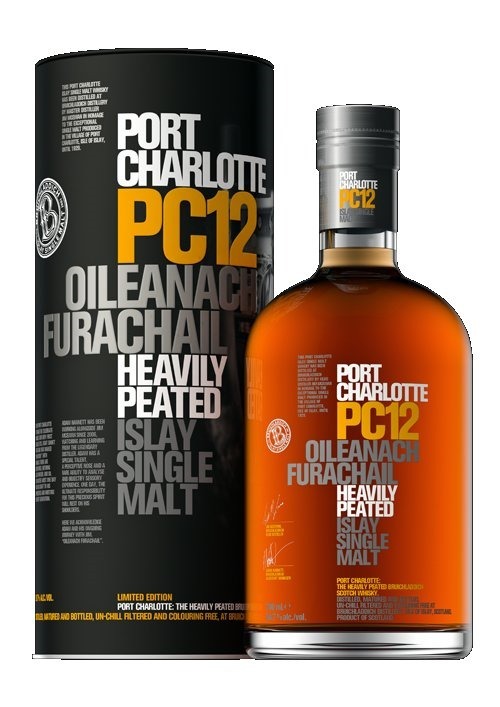 Port Charlotte PC 12 is Bruichladdich’s eighth release of the PC series, which is a series of heavily peated cask strength malts. It has been aged in oak casks for 12 years. Imagine going to a coast side farmer’s festival with a bunch of cigar smokers. This bouquet is packed with barnyard aromas, wood and dry hay, with beaming heart notes of a butter, toffee, nut nougat, bubble gum, sweet rose, cinnamon, cotton candy, citrus, sweet sappy wood, and sea salt. All the while, the aroma of burning matches and the chocolaty and woodsy scent of a fresh maduro cigar gently whispers… “drink me”. The smell of Neapolitan salami and taralli, packed with anise seed, is carried by citrusy notes of lemon cake and Cointreau. Immediately, the sweet nip of sherry strikes the palate. It succumbs to waves of peat smoke, woodsmoke, dates, and marshmallows over a campfire of twigs and hay. There is something spectacularly complex and woodsy about this malt. Then the palate dries, buoyed by cinnamon, lime, green toffee apple, and honey. The finish is smoky, peaty, peppery, woodsy, drying, spicy, and, citrusy; particularly of lime, orange peel and mouth puckering lemon meringue. Fading notes of anise seed, raisin, sarsaparilla and licorice also intermingle with warming overtones of cinnamon and pickled ginger. Buy it. Jack Nicholson’s face has never randomly come to my mind. For some reason, I can see his raised eyebrows, trade mark smile and dark sunglasses. It might be my subconscious calling. Maybe this whisky is “As Good As It Gets”. Whatever the reason, there is very little I would change about this malt. If potent and fiery peaty malts are your thing, with a bit of sherry oak and a guaranteed 12 years of age on the clock, this is your whisky! This entry was posted in Islay and tagged Bruichladdich, islay, malt, PC, peat, port charlotte, Scotch, scotland, single malt, whisky. Bookmark the permalink.